Companies are always continuously on the outlook for ways and means by which their brand gains visibility. Because it is the consumer which makes a difference to their brand’s perceived value. So sponsorship offers recognition and image positioning to the companies. This is the precise point that your event needs to target and leverage your sponsorship deal for your event so that it is compelling deal for both of you. Then how do you plan your event and yourself to attract corporate sponsorship? How do you make your event an attractive proposition? Before you start the plan of approaching companies for sponsorship, how well do you know about the event you are organizing? Are you aware of the nuances and is your event well coordinated? Is the event going to target audiences which may interest the company? Be clear about the demographics and work on that line. That is where the company likes to put their money. See if the event is feasible. Later do a thorough detailed research about the target companies in and around the locality. Get personally involved right from the planning and strategy part to the conclusion of the event. Take the leadership responsibilities and delegate tasks to people and continuously do a follow-up. When you assume the role of a leader it helps in getting quality and maintaining standards. And as in case of a good leader, take initiatives and keep your team members involved in the running of the event. Let your event be unique of a kind which will attract customers. Is it something related to a social cause? Or does it involve children? Are you going to rope in some celebrities or sportspersons? Try to invite guests who are popular locally. The more the guests, the more likely the companies are going to find sponsoring your event attractive. And also for the companies, sponsorship gives better returns than the traditional means of advertising. So when you sell your event as a cause related one, the company would like to get involved because they would want to align themselves as good responsible models. If you are going to advertise the event on social media, how can sponsors be included in it? In what places can the logo and names of the sponsors be displayed where the event is held. Divide the area into groups. Like one main sponsor for the stage, one sponsor for the welcome banner, 1-2 on the back of seats, one on the shirts which the event managers would be wearing and so on. This not only makes your task easy, but also gives the companies freedom to choose depending on their budget. How much is the event going to cost you? Make a list of the expenses involved and the last minute probable inclusions. When your budget is prepared, now your task is to divide it into portions and see which companies can be approached for it? The main stage banner and the entrance banner will attract the maximum sponsor and cover the major portion of your budget. So which are the companies that are the potential targets for huge amounts and which other company would sponsor the logo on the t-shirt? Plan on it and plan on alternatives also. Leverage your local contacts to the maximum. See if they know any person from the company personally. Or atleast ask them if they know any important person so that he can be invited as a guest. Companies situated in the locality or trying to set up base in the locality usually are in the search for popular local persons so that they are in the good books of the locals. Approach such personal contacts and try to win over them first. 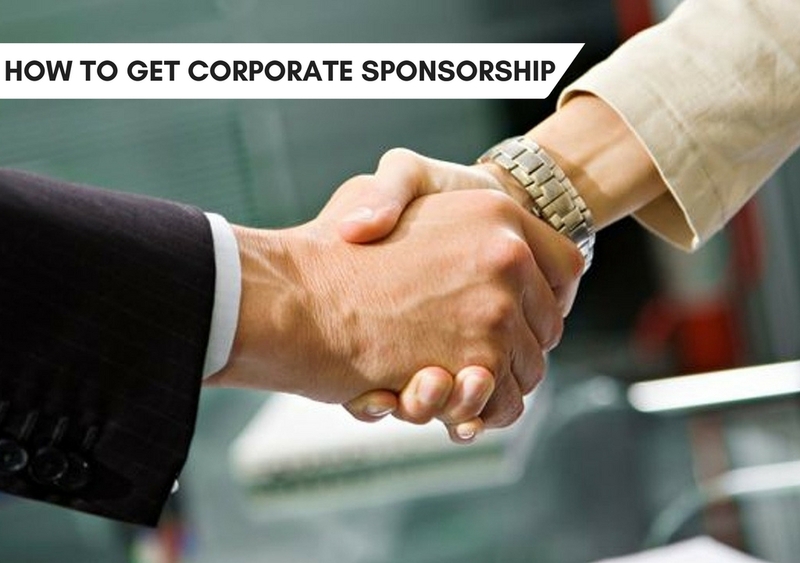 Make a study about the companies you will be approaching for sponsorship. And try to relate the event with the company. Like for example, if you are organizing a local boxing event, it is advisable that you go looking for companies who sell clothes or sport equipments. Make a detailed research about the companies and how much they spend on event sponsorship. What type of events do they generally sponsor? Are they in the process of launching a new product? Then surely they might be looking at all aspects to market the product. Try to set your event as a launch pad for their product. Know how to explain your event and its purpose to the company. Explain about your mission, your plan and sell your event picking up on all the important points. If the company wants to reach out to the local community, take it as an advantage and tell them that the event will be attended by the locals. If they are interested in media coverage, tell them that the event will be covered by some popular media houses. Tell them if your event has any social cause. When you know how to pitch the event as an advantage for the company, no company is going to reject the proposal. Why will the company be interested in lending their money to you, when they have no benefits? Try to think from the company’s perspective. How would you try to squeeze out as much juice as you can from the event if you owned the company? So tell them plans which sell. It may be something like banners printed with their logo on it. If it is an event for the children, then pencils or rulers with the company’s name printed on it can be distributed to the children. If it is a cleanliness drive, cloth bags having the company’s name and logo can be disbursed. This will make the prospects for the company more alluring and appealing. Let the promises you make be realistic. The company should know that you have come prepared and you know what your task is. Tell them briefly about your chalked out plan so that they believe in you. Like it is no good if you tell them that you have invited such a celebrity to the event. Instead tell them that you have invited such a celebrity and he has accepted the proposal to be present at the event. Convey to them clearly that you mean business when you talk to them. Once you have made allocations and you have presented in front of them your proposal, be clear on it. There should be no haggling on the logo display or the place of its display. Let them know that there are other companies ready to take the sponsorship and that you haven’t come here to beg. Be clear about the mode and date of payment. Don’t let them settle it for another day. And more importantly, don’t let them tell you that a part of the payment will be done after the event. If there is an issue of payment when you approach the company, politely refuse to be taken in to their assurances. Because it is better that you search for alternatives than to be dependent on them. Now, every company will have a person allotted to deal with this kind of sponsorship work. Your main target is exactly that person and his team. If you are able to win the trust of that man, then your sponsorship is assured. So prepare a page report sketching the details of the event and go personally to meet him and deliver your proposal report to him. Talk to him and make him feel important. You could even ask suggestions from him to make the event more successful. Remember to take him to confidence and then the rest of the work will be automatically taken care of. How do you market your event instantly without spending a single penny on it? It is through social media. Prepare an event proposal and put it out on social media. Share it in your network. It is more effective than placing banners on roadside or college gates. And it doesn’t even cost you anything. Keep placing teasers on the media so as to arouse interest in the people. Like if a cricketer has agreed to be a guest, send out a teaser hinting that a cricketer would be the guest without revealing his name. After a week, send the next teaser saying that the guest has scored a century in the latest tournament. This way, you keep the audience interest till the end. And when companies come to know the curiosity that your event has generated, they will not hesitate to sponsor the event. Always don’t be dependent or confident that a company may sponsor you big time. Be prepared with alternate plans. Reach out to other companies too no matter how big or how small they are. It may happen that you get a good deal out of a miniscule company and that the big boy falls short on promises. That is when you come to know that facts are different from assumptions. We would suggest that you reach out to the maximum companies. And do not get unduly worried about where you are going to place their logo. Advertising finds a way by itself. The more companies you get sponsorship from, the more grand your event is going to be and more the audience it will attract. Don’t be disappointed initially if one or two companies don’t find your proposal attractive. Keep working on its promotions. It is just a matter of time till the word spreads and you start getting sponsors from the front. If you have promised to your sponsor that their logo will be placed at the entrance, take adequate care that the task is fulfilled. And if you are having any alterations in plan, convey it to the company beforehand and take their permission. After the banners are printed, it will be resourceful if you visit the company again and show the designs to them. Keep them involved because their money is also involved. You can even sell small souvenirs with the company logo and the event name through social media. This will help the company in its advertising and help you in event promotion. Pay attention to minute details on the day of the event regarding the placing of logos and banners. If you give the companies a reason to be unhappy, then they will not be interested in you the next time. Once the event is done, your responsibilities do not end. The companies have been a part of the event and it would not be successful without their contribution. So express it by meeting them personally and thanking them for their sponsorship. Let them know when the event gets published in the local media. You could even share your experiences and the reactions of the people to the event. You can thank each and every sponsor on the social media and write nice words of acknowledgement. Keep in touch either through personal engagements or invitations to other events. This will gradually build trust and will ensure that your event gets sponsored the next time too. When attracting corporate sponsorship remember that you need to change with time. Your strategy, the uniqueness of the events, your process of organizing events all need to evolve. This helps in building innovativeness and maintaining standard in your events. And when you live up to the challenge of organizing events which are interesting and attracts audiences, then naturally your events will also attract corporate sponsorship.